﻿ YUGAGRO 2017 – The largest exhibition of Russian agribusiness again successful! YUGAGRO 2017 – The largest exhibition of Russian agribusiness again successful! From November 28 till December 1 the 24. edition of agricultural trade fair YUGAGRO took place in the city of Krasnodar in southern Russia. 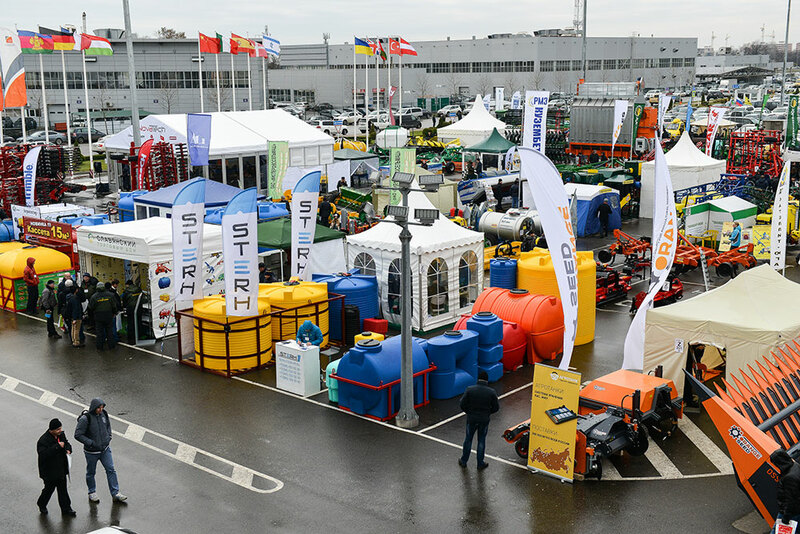 On 65.000 square meters of exhibition space, 679 exhibitors (among them 194 new ones) from 35 countries and 38 Russian regions presented their latest products ranging from tractors, agricultural machinery, plant production and storage to agricultural chemistry, seeds, as wells as irrigation systems and greenhouse equipment. This year the exhibition counted 17,000 trade visitors from various regions of Russia and its neighboring countries, which is a seven percent increase to the previous year. YUGAGRO was this year’s largest and most important agricultural trade fair in the Russian Federation. Even the outsourcing of the animal husbandry sector did not diminish the exhibition’s appeal. Many exhibitors already pre-booked in order to secure the opportunity to present themselves again in their usual location and in best shape at next year’s event. The organizers proudly announced that 90 percent of the available spaces for 2018 had already been pre-booked before this year’s exhibition even finished. Germany was, as in previous years, present with a joint stand supported by the Federal Ministry of Economy and Energy. Considerable 31 exhibitors presented their innovative products and technologies under the brand “Made in Germany”. The official opening of the trade fair was performed by the governor of Krasnodar Veniamin Kondratyev, the chairman of the legislative assembly of Krasnodar Yury Burlachko, the Swedish ambassador Peter Erikson and the Dutch ambassador to Russia Renee Jones-Bos. The YUGAGRO business program was comprehensive and diverse. Exhibitors and invited guests had the opportunity to attend 35 different events including conferences, seminars, and roundtable discussions. Among the discussed topics were the export potential of Russian agribusiness and the current trends in horticulture. According to the present trend, the Russian agriculture and food economy will continue to develop positively in the coming year. This year alone, the state supported agriculture with 216 billion Rubles. Until 2020, a total of one trillion Rubles in state subsidies are supposed to be invested with the purpose of becoming completely independent from food imports within seven years. In terms of agricultural production, the region of Krasnodar traditionally ranks first in the country. Last year, agricultural produce worth 420.9 billion Rubles was produced, 6.1 percent more than in 2015 and twice as much as in 2010 (201.5 billion Rubles). In the first six months of 2017, investments in the agro-industrial complex of the region of Krasnodar accumulated to a total of 17 billion Rubles. This is five percent more than in the same period last year. The next YUGAGRO will take place from November 20 to 23, 2018. In order to secure an attractive placement, interested companies have the opportunity to pre-register with the organizer IFWexpo Heidelberg GmbH.